Pawz, a Brooklyn-based maker of rubber boots for dogs, is one of the businesses enjoying huge sales because of the snow. If there's a silver lining to the snow storms that have walloped the nation, businesses that make weather gear have found it. While the winter weather has stunted sales for many East Coast businesses, the Original Muck Boot Company in Smithfield, R.I., has seen sales of winter boots skyrocket. "This winter cycle has been tremendous for us," said Sean O'Brien, global director of retail footwear. The company typically counts on the fall and winter seasons for 70% of its sales, but this year already seen a 20% increase in boot sales from last year. "It's turning into our best year ever," O'Brien said. "It's seems odd to say this, but the nasty, cold, slushy weather is core to our business. We welcome it." But the surge in demand for its all-weather boots, priced from $120 to $200, has also triggered some inventory challenges. "There's no way we could have anticipated this weather," said O'Brien. So they've asked the China-based factory to ramp up production and even flown in extra orders. The snow and slush has also created a run on doggie boots. Brooklyn-based Pawz makes bright-colored rubber boots that protect the sensitive padding on dogs' paws from extreme cold, salt and other chemicals used to melt the snow on roads and sidewalks. 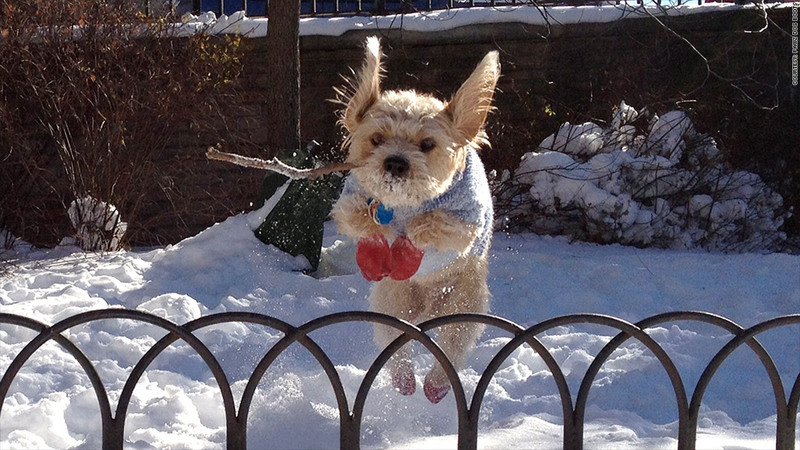 Sales of its dog boots, sold nationwide, typically peak in the winter, said President Michael Friedland. "But this year, starting with the Polar Vortex until now, our sales are up 40% over last year." Friedland said he's been hearing about shortages from stores in New York and other East Coast states. "In some stores, you're not seeing our product on the shelf at all," he said. "We're in a battle to increase inventory." Even some businesses north of the border are benefiting from the United States' frigid temperatures. Montreal-based Watson's has been making thermal underwear since 1945. About 40% of its sales come from the U.S., which are up 20% from last year, said VP of Sales Dan Khoury. "Last year, winter came a bit late and retailers in the U.S. began removing our products early to make way for spring merchandise," said Khoury. "This winter, it's the opposite. It's been cold from the beginning, which means our products are still in stores." All American Clothing Co., in Arcanum, Ohio, is enjoying robust snow-driven sales of its Made-in-the-USA hooded sweatshirts, coats, beanies and other winter products. "Our sales from January to now are already up 140% over last year," said Boomer Beam, the company's marketing director. And in the snow-strewn states of Ohio, New York, Georgia and North Carolina, sales are up a whopping 204%. "It's going to be one of our strongest years to date," said Beam. And they're trying to capitalize on it. Their hooded sweatshirt has been in high demand, but it only comes in three colors. So Beam said the company quickly added three more colors, which, not surprisingly, have been flying off the shelves as well.